Great deals and features come standard on the most popular Honda models at Walla Walla Valley Honda, and that goes double for our Presidents’ Day savings. But if you don’t have the time to break from your celebrating of our forefathers this Presidents’ Day, don’t worry — the savings on brand-new 2015 Honda models last all week to make sure you can fulfill the new American Dream of driving home a brand new Honda. The Presidents of the United States are bringing the prices down for a limited time to help make that American Dream all the more achievable for our customers. Take advantage of these Honda lease specials while they last! 2015 Honda Accord: Honda’s flagship mid-size car comes in sedan and coupe builds and continues to feature amenities like Bluetooth, a rearview camera, and a touchscreen infotainment system to set it apart from competing cars. Drivers can lease a 2015 Accord CVT LX at $199/month for 36 months with $1,999 down or a 2015 Accord Coupe CVT LX-S at $209/month for 36 months with $2,599 down. 2015 Honda Civic: Like the Accord, Honda’s famous small car is also available in both sedan and coupe styles and keeps up its reputation as one of the most fuel-efficient small cars (2015 Civic CVT models earn an EPA-estimated 39 highway mpg*). Lease a 2015 Civic CVT LX Sedan starting at $159/month for 36 months with $2,699 down or a 2015 Civic CVT LX Coupe at $169/month for 36 months with $2,899 down. 2015 Honda CR-V: One of the world’s first crossovers continues to be one of the best, and the 2015 model of this five-seater SUV just recently received an engine upgrade to make it even more efficient. 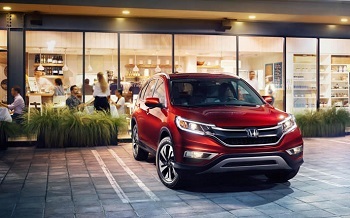 And now you can lease a 2015 Honda CR-V 2WD LX starting at $239/month for 39 months with $2,199 due at signing. 2015 Honda Odyssey: This family minivan has room for up to eight and an easily-expandable cargo area for when you don’t have the kids in the back seat. Earning an EPA-estimated 28 highway mpg**, it’s easy to fit the the Odyssey into a family budget with a $269/month lease with $2,999 down. This 36-month lease is available on the 2015 Odyssey LX. 2015 Honda Crosstour: Looking for a family-friendly station wagon? The Crosstour crossover is the closest thing to the old family standby, combining the benefits of an Accord and a CR-V into one vehicle. Lease a 2015 Crosstour 2WD EX starting at $299/month for 36 months with $2,999 due at signing. 2015 Honda Pilot: An eight-person crossover SUV with the latest features, a powerful V6 engine, and an impressive towing capacity — could you ask for anything more of a family vehicle? Drive home the 2015 Honda Pilot 2WD LX starting at $259/month with $2,199 due at signing on a 36-month lease. We’ve extended our Presidents’ Day Sale to a full week, but you’ll be surprised just how fast that week goes by. Be sure to stop by Walla Walla Valley Honda soon before the savings slip away. Contact us online or give us a call at (509)-593-4809 with any questions about the sale. Happy Presidents’ Day! *28 city/36 highway/ 31 combined mpg rating for 5MT models. 30 city/39 highway/33 combined mpg rating for LX CVT model. 29 city/38 highway/33 combined mpg rating for EX and EX-L CVT model. Based on 2015 EPA mileage ratings. Use for comparison purposes only. Your mileage will vary depending on how you drive and maintain your vehicle.